AS the bike in my mirrors drew nearer I got my head down, cracked open the throttle and went for it, but in no time it was on my tail. The narrow, twisty road allowed me to hold it off, but as soon as the road straightened out a bit I was left standing. 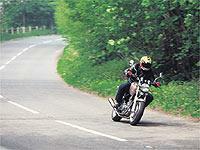 The second bike was a Bandit 600, and I was on the all new Sachs 650 roadster. The easy-to-ride single is no sports bike, but it still relishes being chucked around through corners and can stand its ground against more capable machines if the roads are right. Sure, the Bandit passed me with ease, but only once the road had straightened out. The Roadster uses a Suzuki motor, the same used in the Suzuki Freewind trailie-style single, which makes a claimed 50bhp. It’s a little bit vibey, particularly at higher revs, but nothing you can’t live with. It isn’t the most exciting engine around. It’s a bit of a plodder – making it an absolute doddle to ride at a relaxed pace. Try and get a shift on and you’ll be left feeling frustrated. Making progress along decent A-roads is all about momentum; fast gearchanges so as not to let the revs drop even a couple of hundred rpm more than necessary, keeping the throttle pinned at all times and resisting the temptation to dab the brakes. Ridden like this the Roadster will have you chortling all the way home – after all there aren’t many bikes you can keep nailed permanently. Quite how long this satisfied feeling will last is a different question. German firm Sachs is better known for making suspension, but it has already built a couple of funky 125s and the Roadster is its latest offering. Expect an 800cc twin to follow next. The chassis is made in-house and is pretty basic. The frame is a no-frills steel tube set-up with twin shocks and non-adjustable front forks. Both ends are firmly sprung, but could do with some more damping, especially at the front. This manifests itself as a serious front-end patter through medium to fast corners, and causes the Sachs to understeer. It’s something you quickly get used to, but somewhat unnerving at first. The back end is more reassuring, although it feels like it is making the tyre work hard. But the standard fitment Pirelli Dragon tyres are more than up to the job and will keep things in line right up until the footpeg scrapes the floor. This happens a lot sooner than you’d expect as the pegs are very low, but again it reinforces the fact that this machine wasn’t designed with extreme lean angles in mind. The brakes are adequate, but nothing to shout about. The single-disc front set-up works fine, but the back will lock up with no warning if you so much as get a little heavy with it. After a long day’s ride there’s nothing better than pulling up for a chat with fellow riders and the Sachs certainly attracts plenty of comments... not all of them complementary. A lot of it depends how you look at it. There is a bit of a supermoto look thanks to the wheels, which looks as though they’re straight off a KTM. Look at it another way and there’s a hint of classic BSA or Triumph about it. If you want to attract plenty of attention without paying through the nose, the Sachs could be the bike for you. Back out on straight roads and the Roadster’s not really a lot of fun. Singles in general don’t really lend themselves very well to motorways and dual-carriageways and the Sachs is no exception. It’ll start to struggle at much over 90mph – a situation not helped by the lack of wind protection. It’s not possible to reach peak revs in top. Even lying on the tank makes no difference as you are still acting as a massive wind break. The only way to increase top speed is to slipstream another bike, but that’s hardly viable on the road. This isn’t the sort of bike which is ever going to have mass appeal. The Roadster will be fine for town-based couriers and commuters, but its looks may prove a little too oddball for some. It’s not as bizarre as Aprilia’s Moto 6.5, but it’s far from mainstream. And at £4595 on the road it’s not that cheap either. Similar money will buy you a Honda Hornet, Suzuki Bandit 600 or Yamaha Fazer – all of which are superior machines with stacks more power. Still, if outright performance doesn’t float your boat and you fancy something a bit different, the Sachs Roadster is worth a look. Is the new Honda CBR600 worthy of the name?